The Superman Fan Podcast: Episode #382 Part I: Superman Family Comic Book Cover Dated May 1965: World's Finest Comics #149! Episode #382 Part I: Superman Family Comic Book Cover Dated May 1965: World's Finest Comics #149! World's Finest Comics 149, May 1965! Download Episode 382 Part I! WORLD'S FINEST COMICS 149, May 1965, was published on March 11, 1965. It contained 32 pages for the cover price of 12¢. Mort Weisinger was the editor, and the cover was pencilled by Curt Swan, inked by George Klein and lettered by Ira Schnapp. - (6:19) THE GAME OF SECRET IDENTITIES (17 pgs., Part I was 9 pgs. ), written by Edmond Hamilton, pencilled by Curt Swan and inked by Sheldon Moldoff. This story was also reprinted in SHOWCASE PRESENTS: WORLD'S FINEST vol. III. - (39:55) CAPE AND COWL COMMENTS letter column. - (46:25) THE CONGORILLA OF SPACE (7 pgs. ), written by Robert Bernstein and drawn by Howard Sherman. This story was originally published in ADVENTURE COMICS 276, September 1960, originally published on July 28, 1960. Next Episodes: SUPERMAN COMIC BOOKS COVER DATED MAY 1965: PART II: SUPERMAN 177, PART III: ACTION COMICS 324 & PART IV: SUPERMAN'S GIRL FRIEND LOIS LANE 57! I realize that, in the Silver Age, the covers didn't always quite match the stories inside the issue, but in this case, the cover suggests the reverse order of the events, with Batman and Robin erasing Superman's knowledge of their secret identities first. 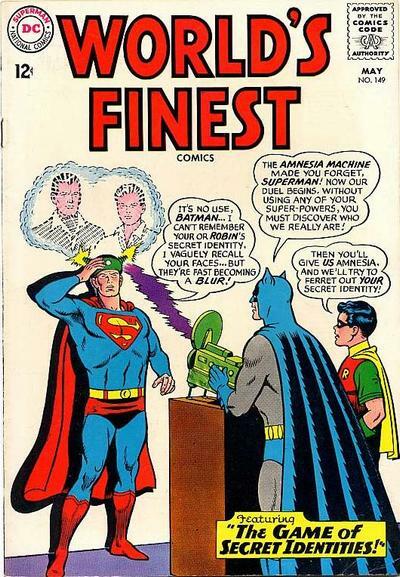 If the story had happened that way, I imagine, based on Superman's obsessive behavior, Batman and Robin would not have wanted to be exposed to the amnesia machine, themselves. It might have improved the story a bit if writer Edmond Hamilton had provided readers with an explanation of Superman's behavior, like maybe erasing his memories of the Dynamic Duo's identities had somehow unbalanced his mind a little. His behavior really was out-of-character and should have been explained, and I'd have expected a writer of Hamilton's caliber to address it, somehow. In the "Cape and Cowl Comments" letter column, it was interesting to hear the reader's comment about the coincidence that Superman's and Batman's mothers were both named Martha. The reply that both George Washington and Thomas Jefferson were married to Marthas suggests that the editors at DC didn't really regard this as a very big deal. I liked your comment wondering if Zack Snyder had read this letter.